In my previous blog, I mentioned that the book “Handbook of Korean Art” indicates in Korean folk paintings, humor and satire are prominent elements. I explained how they are composed in Hojakdo. But the book does not tell why and how humor and satire in Korean folk painting evolved. It seems this is because the book is just a handbook, introducing Korean folk paintings to Americans briefly and focusing more on displaying various folk paintings. I even looked on the Internet but I did not find the way and reason satire evolved in Korean folk paintings. I probably didn’t find much because I searched in English, not Korean, and there don’t seem to be many resources in English. Even on Korean sites, though, there was no clear explanation. At this point, I felt more historical research on Korean folk paintings is needed. Part of the problem is that since Korean folk paintings’ artists and dates are not known, they have not been viewed as historical records in Korea. Based on my research and knowledge of Korean history, I realized that satire in the paintings reflected the Korean society during the 17th Century. At that time, Confucian philosophy shaped Korea by defining jobs and duties. The Confucian social hierarchy was rigid with the aristocracy or yangban serving as the government officials. Common people comprised the next level down, and were called yangmin; most were merchants, artisans, craftsmen, and farmers. The bottom class was the slave class, called chonmin. Yangmin and chonmin had to obey yangban. Yangmin composed most of Korean society. Many of them suffered from some yangban’s oppression, ignorance, and corruption. Instead of expressing unlawful violence and anger toward the yangban, the common people chose to ridicule them through paintings. Interestingly, another interpretation of Hojakdo is that the magpie in the paintings represents the yangmin themselves while the tiger represents the ignorant yangban. Although the magpie may seem weak, it is intelligent and looks down on the funny-looking tiger which thinks it is fierce. Such typical Korean satire and humor continues today. The music video Gangnam Style that went viral in 2012, and is the the third most viewed and liked video on YouTube, ridicules wealthy citizens from Gangnam, which is one of the 25 districts of South Korea’s capital, Seoul. While Gangnam represented only 3 percent of South Korea’s population in 2010, 40 percent of Seoul’s registered assets were concentrated in Gangnam. Therefore, the artist PSY satirizes ostentatious Gangnam residents going to parties through a hilarious dance. 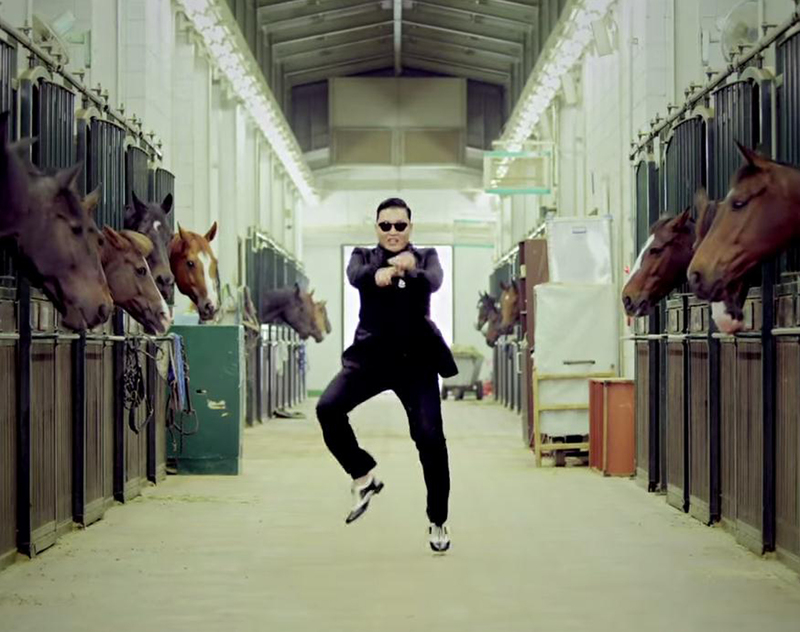 The Gangnam style video is similar to Korean folk paintings in that both mock the power and privilege in Korea. Humor and satire prevailed in last year’s Korean presidential impeachment and election. 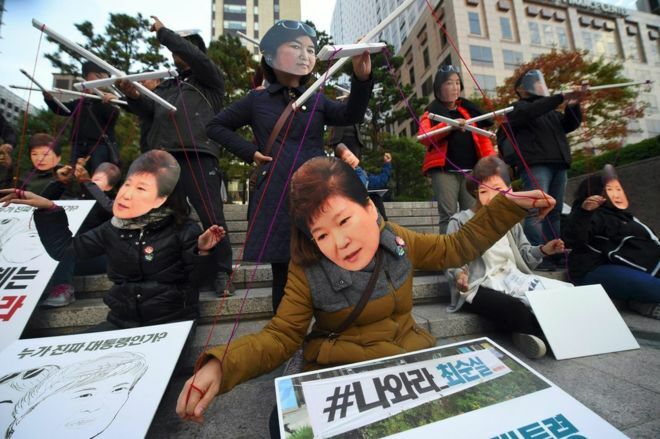 During the protests on the street, which demanded impeachment, diverse events were held such as puppet plays and drawing caricatures that depicted the former president being controlled by her not elected friend. 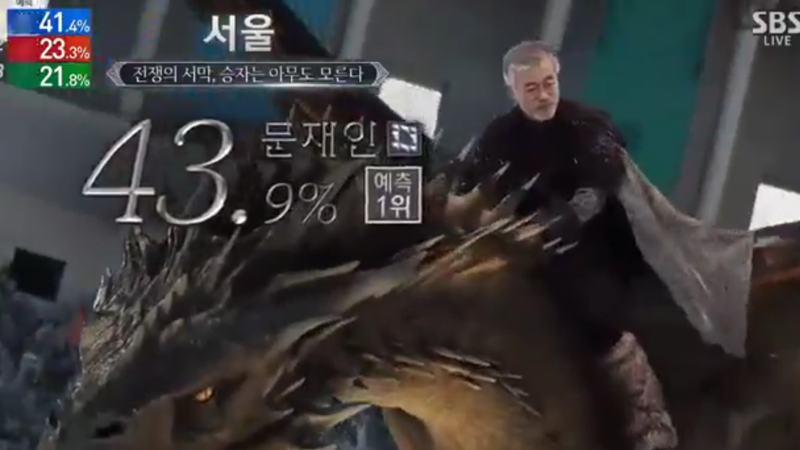 After the Korean president was impeached, during the new presidential election exit polls of several broadcaststers, presidential candidates were hilariously portrayed as characters from Game of The Thrones, riding on a dragon, or creatures of Pokemon Go. Koreans were entertained watching the humorous exit polls, in the same way that Korean folk paintings entertained their ancestors unlike the traditional, dull, and ordinary exit polls which project an image of “high” status and education, like sophisticated ink paintings. The humor and satire appeased the anger that the Koreans had toward the former corrupt government and showed the strength of the citizens through portraying Korean president candidates hilariously instead of figures of respect and fear, as the yangbang and modern powerful figures saw themselves. Yoon, Yeol-su, et al. Handbook of Korean Art. Yekyong Publishing, 2002. “Park Geun-Hye and the Friendship behind S Korea’s Presidential Crisis.” BBC News, BBC, 31 Oct. 2016, http://www.bbc.com/news/world-asia-37820112. O’Connor, Roisin. “Gangnam Style Video by Psy Surpassed as ‘Most Watched’ YouTube Video by Wiz Khalifa and Charlie Puth.” The Independent, Independent Digital News and Media, 12 July 2017, http://www.independent.co.uk/arts-entertainment/music/news/gangnam-style-video-psy-youtube-most-watched-charlie-puth-wiz-khalifa-see-you-again-a7836576.html. Mailonline, Charlotte Ikonen For. “Nuclear Winter Is Coming? Hilarious South Korean Election Coverage Portrays Candidates as Game Of Thrones Characters (so at Least Someone Isn’t Worried about Kim’s Nuke Tests).” Daily Mail Online, Associated Newspapers, 10 May 2017, http://www.dailymail.co.uk/news/article-4492074/Epic-election-results-parody-Game-Thrones.html. Miller, Tanya Jo. “Is ‘Gangnam Style’ a Satire About Korea’s 1%?” The Huffington Post, TheHuffingtonPost.com, 3 Sept. 2012, http://www.huffingtonpost.com/tanya-jo-miller/gangnam-style_b_1847706.html. This entry was posted in Visual and Performing Arts and tagged Korea, Korean folk art, westtown school on October 23, 2017 by mikehyojan. This is a super interesting interpretation of the role of humor not only in Hojakdo, but in Korean society as a whole. I appreciate how you identify a thread in Korean history and then use that thread to tie together your project and Korean culture today. Very well done! You know, I had no idea that Gangnam style was a very strong political statement… It makes me wonder what other media Americans consume without knowing, understanding, or appreciating the political, social, or cultural context. It’s interesting how art has been used as political satire and commentary over history, from the ancient Korean folk art to popular media today.